The Pittsburgh Penguins are reportedly extending forward Patric Hornqvist to a five-year contract extension worth $26.5 million, according to Bob McKenzie. The deal comes with an annual cap hit of $5.3 million cap hit and locks up one of the Penguins core players for the long-term. 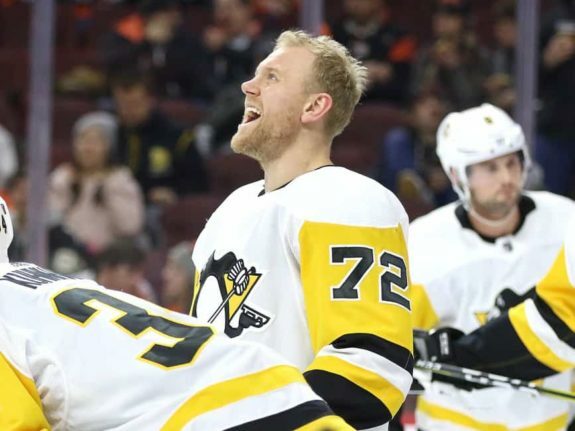 Despite being 31 years old, the Penguins are rewarding Hornqvist for his excellence over his four seasons in Pittsburgh that has been crucial to their success. With 17 goals and 32 picks in 51 games this season, Hornqvist looks primed to eclipse the 20-goal mark again this season which would give him eight seasons with upwards of 20 goals with the only exception coming in 2012-13 when the veteran only skated in 24 games with the Predators. 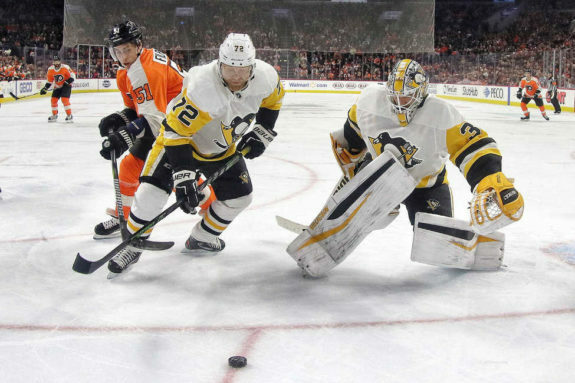 Consistency is so important in professional sports and Hornqvist has been consistency personified, especially with the Penguins – a team that’s seen him take a secondary role to stars like Sidney Crosby, Evgeni Malkin and Phil Kessel. While Hornqvist has been a part of the team’s core, his production hasn’t been the focal point of this team like it was when he was a member of the Predators. With the knowledge that he can be an essential guy without being “the guy,” Hornqvist has looked like a star for Pittsburgh. Having said that, Hornqvist is more than capable of producing when the spotlight is on him and he’s been able to make an impact no matter what role he’s skated in. The fact that he isn’t tasked with scoring the most points makes his 20-plus goals and 50-plus points each season an essential part of the Penguins ability to win games and has been crucial in their consecutive Stanley Cup victories. Though he’s only scored 22 points over the last two postseasons in 43 games, his contributions on the ice go far beyond just point production. Whether it’s his two-way ability or his experience in the league in general, the transition for some of the Penguins younger players has been made easier due to Hornqvist’s leadership skills. The Penguins have been a model for many teams over the last few seasons, though their strategy looks reminiscent of what the Chicago Blackhawks employed for their three Stanley Cup Championships. In essence, the strategy is to identify a core, build around that core and fill in the other key positions with young rookies and depth additions. For the Penguins, Hornqvist is clearly a part of their long-term core. While some teams may be hesitant to sign a 31-year-old to a contract with the cost and term of Hornqvist’s new deal, the Penguins are simply continuing to build around their current model. It’s worked for them twice in a row and they are looking to capitalize on a three-peat; a feat. that hasn’t been done in the NHL in decades.